Today is National Boss’s Day. 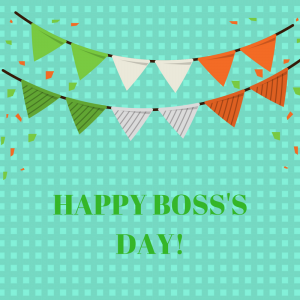 On this day, I naturally think of those who play the role of supervisor at work as “bosses”. The beautiful ladies I supervise ( but who require no supervision because they are so wonderful) sent me a bouquet of my favorite flowers – gerber daisies- for Boss’s Day a few days early. Sometimes it’s good to be a boss. Especially when you have good people for whom you are the boss. Sometimes it’s awful to be the boss when correction or dismissal is required. Some people think they are your boss, but they’re not. Some people act like they are the boss of everything and want people to obey. And some people need to be the boss but don’t know how. Since today is also Make A Difference Monday, I want to give you (and me) a great big challenge. Let’s let those people who are the boss, think they are the boss, or want to be the boss have a day of no back-talk. Today let’s just smile and say, “yes, sir” and “thank you, ma’am”. Today let’s just give a pat on the back or a word of encouragement to those who have the “wanna be” mentality. Just for today let’s put Romans 12:18 into action: If it is possible, as far as it depends on you, live at peace with everyone. That doesn’t mean do everything they say that is illegal or immoral but just for today, don’t talk smack about those in authority. Just smile and as far it depends on us, just for this one day for starters, live at peace with everyone. This entry was posted in devotional, inspirational, motivational, spiritual on October 16, 2017 by Deanna Young.